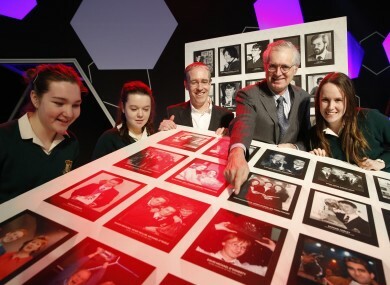 John Monahan, first ever winner of the BT Young Scientist and Technology Exhibition in 1964 (right); Colm O'Neill, CEO of BT Ireland; students (L to R) Sophie Ni Leathobhair (15), Fiona Nic Gemhna (15) and Sinead Daltuin (15). IF THERE’S A sign that the future of Ireland is in good hands, it could be the BT Young Scientist and Technology Exhibition, which is running at Dublin’s RDS until Saturday. When TheJournal.ie ventured in to see what was on offer at the 550 stands, we met teens with great ideas, big plans, and who were brimming with confidence. Over the next three days we will bring you some of the secondary school students we met at the RDS, but there are even more down there whose work is on display until Saturday. Yes, the event will have winners in a number of categories, but it was clear from this year’s participants that the joy in the exhibition is the process rather than the competition. Students have worked on projects about farming, mould, food, road safety maths problems, and even what to feed hens. Some were working on solutions to everyday problems; other students were grappling with concepts that many adults would find it hard to grasp. The exhibition is now in its 50th year, and on Saturday the astronaut Chris Hadfield will pay the teens a visit. Perhaps one of those he meets will become an Irish astronaut; just like their predecessors over the past five decades, many of the students are destined to go on to great things. Email “Meet Ireland's bright sparks at the BT Young Scientist & Technology exhibition”. Feedback on “Meet Ireland's bright sparks at the BT Young Scientist & Technology exhibition”.